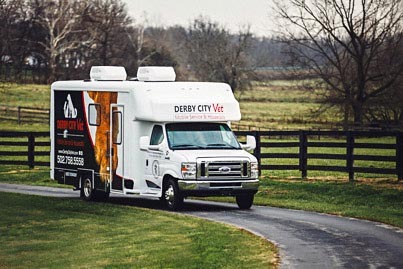 Derby City Veterinary Services is your housecall and mobile vet serving Louisville, KY and surrounding areas! Call us for an appointment at 502-758-5558. Led by Dr. Brigette Dean-Hines, we provide services Monday through Friday with many options to fit into your schedule. Our unconditional love for companion animals extends into our efforts to improve your pet's quality of life. In recognizing your pet as a vital member of the family, we are dedicated to providing the best diagnostic and treatment options to ensure comfort and longevity. Pain management is one of our top priorities, as well as, preventive medicine and client education. We are very proud to embrace the veterinary family practice model, where providing relationship-centered care to best benefit our patients and their caregivers, is a top priority. After Hours and Emergencies Calls: If you have a question after hours simply call our practice and you will be able to speak with a veterinary professional for free even while we are closed on nights and on weekends. If the issue is non-emergent we will help you request an appointment for the next business day! This is part of our commitment to you to always provide the best service possible. Thanks for being amazing clients and we hope to keep you and your furry loved ones happy! Our Mobile Facility allows us to come to your pet's home, away from the stress and discomforts of hospitals, and at a convenient hour for you and your family. We pride ourselves in our solid foundation of knowledge of basic veterinary care, and we challenge ourselves to stay abreast of dynamic veterinary trends.